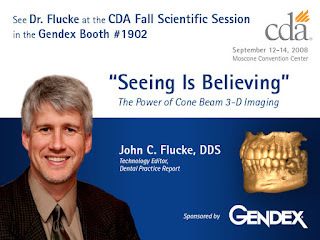 For those of you who are interested in learning more about the fascinating subject of cone beam radiography, stop by the Gendex booth #1902 at the CDA Fall Scientific Session this weekend in San Francisco. I'll be there Friday and Saturday giving my perspective on how and why this will change dentistry. Come by, say hello, and take a look at the amazing images provided by the GXCB-500.